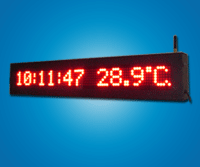 The GPS (GPS Clock Display) is used for navigating and positioning local systems based on reception of signals from satellites. GPS receivers provide highly accurate time fixes anywhere worldwide. GPS system time is a worldwide standard atomic time which is exactly related to Coordinated Universal Time (UTC or "Greenwich time"). Local time is Greenwich Time offset by hours corresponding to local time zone. GPS products can show you your exact position on the Earth anytime, in any weather, anywhere. Global positioning system (GPS) satellites, which contain highly accurate clocks, transmit time signals to earth. The GPS receiver, which can easily be mounted in a window, picks up these time signals and sends them to the master transmitter located inside your premises. This receiver sends the time signal to the GPS wireless clocks throughout the facility. You can have any number of such synchronized clocks with one such receiver. Indicator light to indicate receipt of synchronized time signal. Selection of alternating time and date. 12 / 24 hr format. Tone generator to produce scheduled tones for giving bell or announcement.